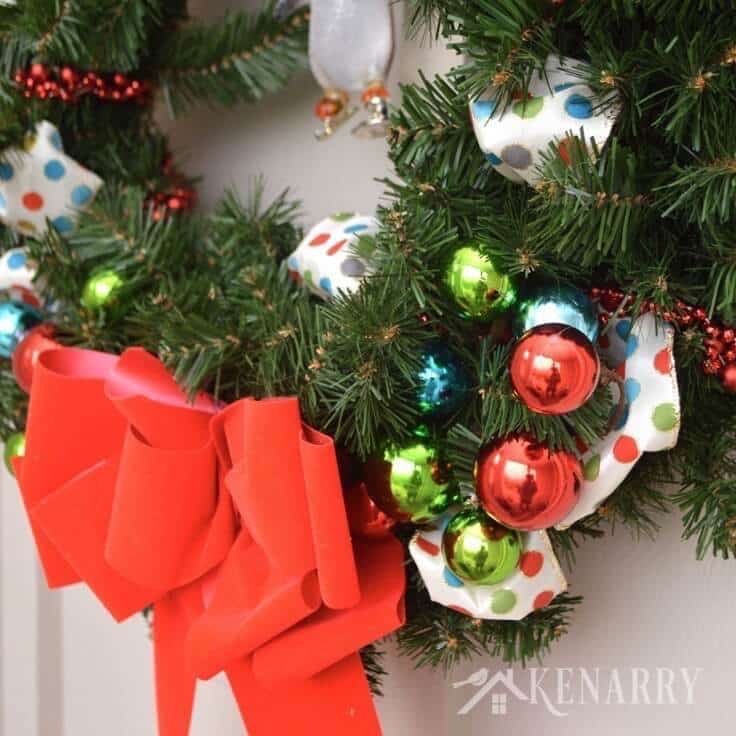 You’ll love this idea to decorate an outdoor Christmas wreath with ribbon, beads and ornaments. It’s beautiful holiday home decor for your front door! 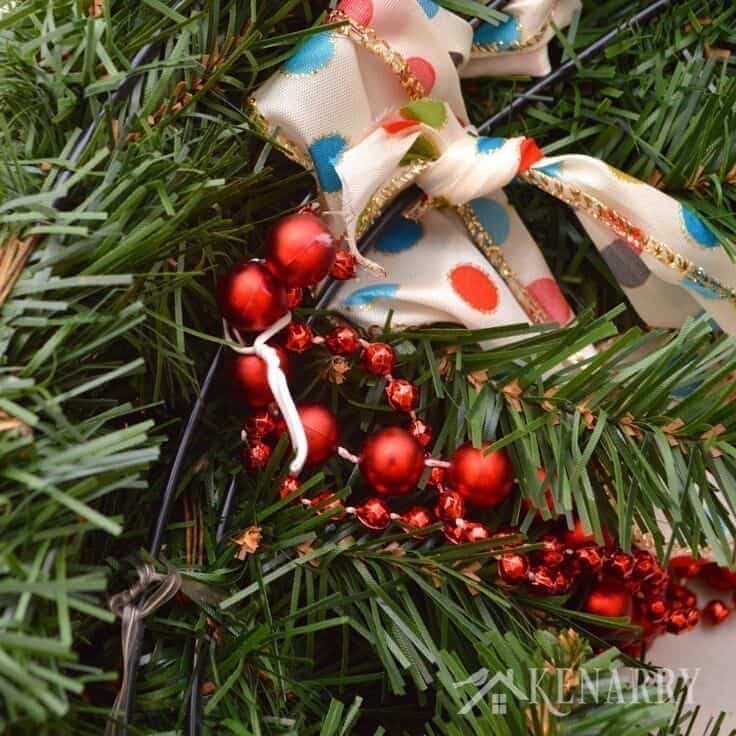 Update a faux evergreen wreath by adding ribbon, beads and ornaments to make a pretty Outdoor Christmas Wreath. It’s a quick and easy holiday craft idea you can make in less than an hour. Plus today we’re also teaming up with HomeTalk.com, CountryLiving.com and countless other bloggers to give you dozens and dozens of other ideas to decorate your home for Christmas! I love decorating my home for Christmas, don’t you? At the end of today’s post, you’re going to find a huge list of amazing DIY decor ideas to try this year thanks to the “Home for Christmas” event being hosted by HomeTalk.com and CountryLiving.com. Please make sure you scroll all the way to the end as you do not want to miss any of these beautiful ideas. It’s chock full of inspiration to help you decorate for the holidays. You can also search HomeTalk.com, Facebook and other social media for the hashtag #homeforchristmas to find and share all the great ideas. I initially liked the simplicity of my Outdoor Christmas Wreath. After years of use though, I thought it was starting to look a little sad and plain and really wanted to jazz it up a bit. 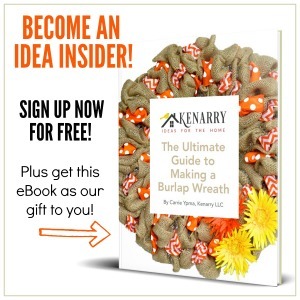 My outdoor wreath for summer is a burlap wreath using two different accent ribbons. I absolutely love it and thought perhaps I could use that same concept to spruce up my Outdoor Christmas Wreath. Only instead of using two ribbons, I decided to use one wide ribbon and a string of red Christmas beads. 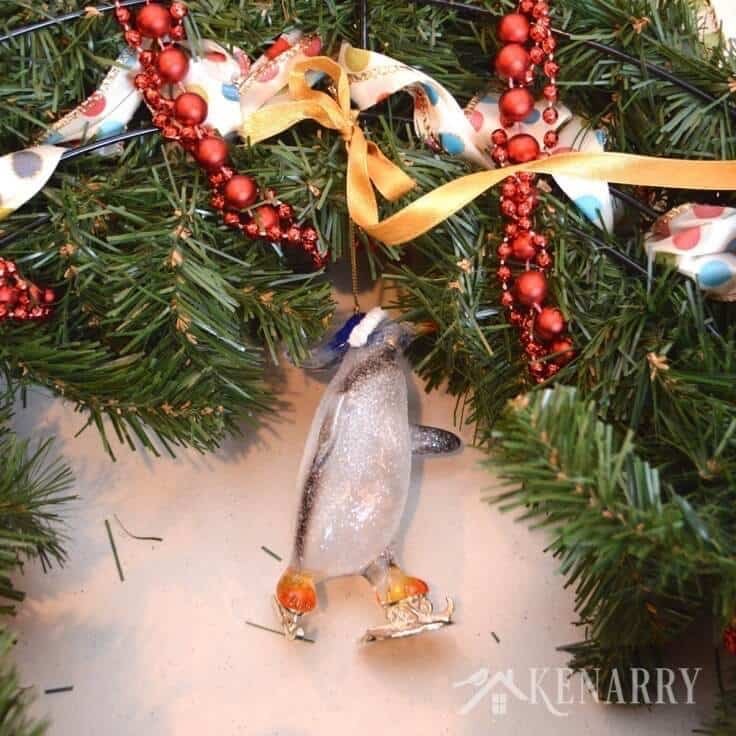 I tucked a few extra embellishments on the side of the big red velvet bow and hung a penguin ornament from the center to finish it off. 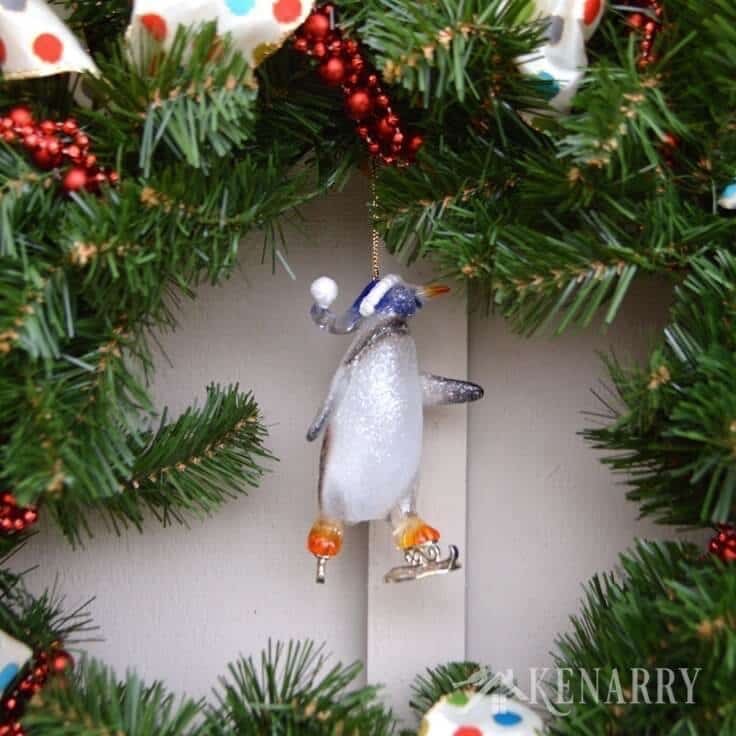 If you ever visit my home for Christmas, you’d know there are penguins EVERYWHERE. It’s only fitting I needed one outside my front door on the Outdoor Christmas Wreath too. 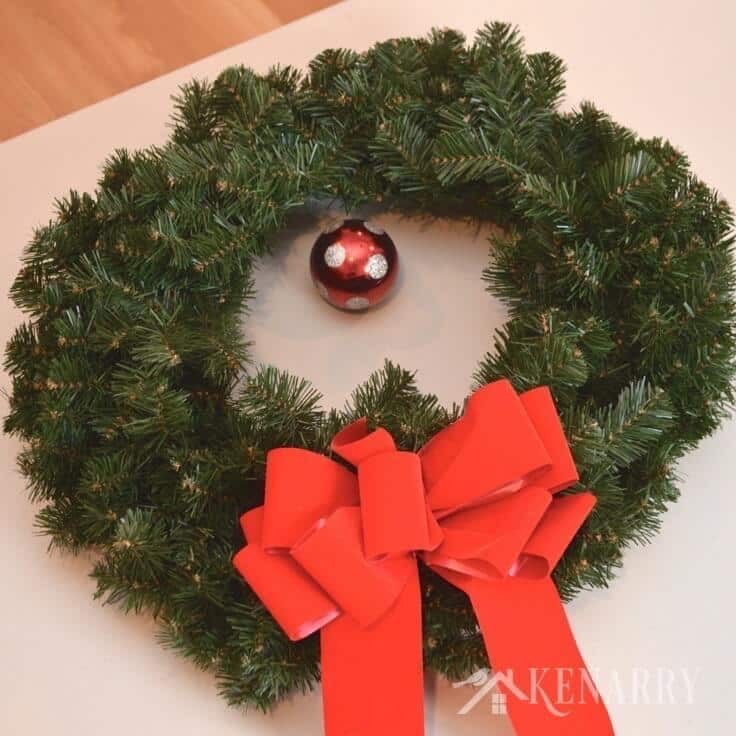 This Outdoor Christmas Wreath is incredibly easy to make. With just a few embellishments, you can whip this craft up to decorate the door of your home for Christmas in less than an hour! The best thing about wreath projects like this is that you can really customize them for your own tastes and preferences. 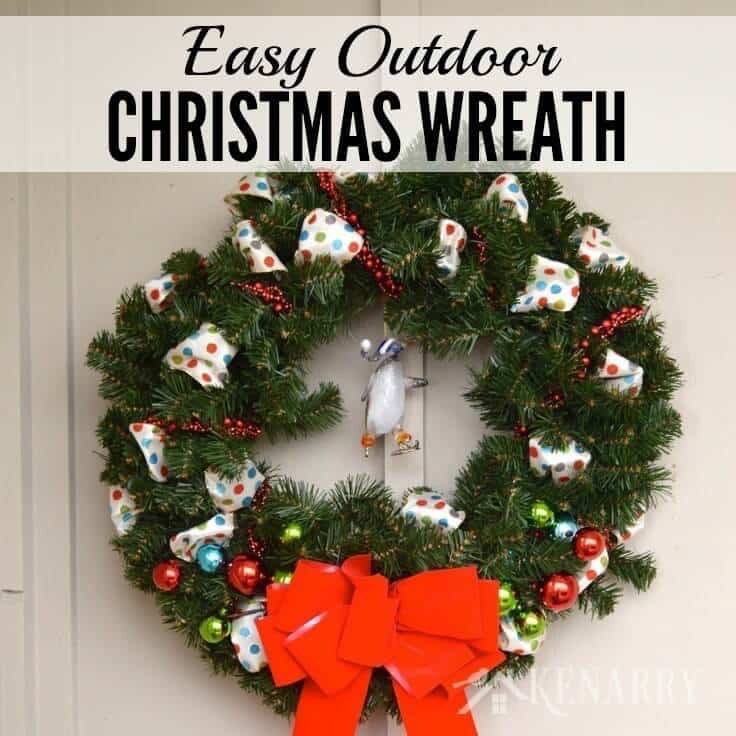 I got all of my Outdoor Christmas Wreath supplies at a local craft store, but for your convenience I’m sharing links below to where you can buy similar products on Amazon. 1. Attach the red velvet outdoor bow. 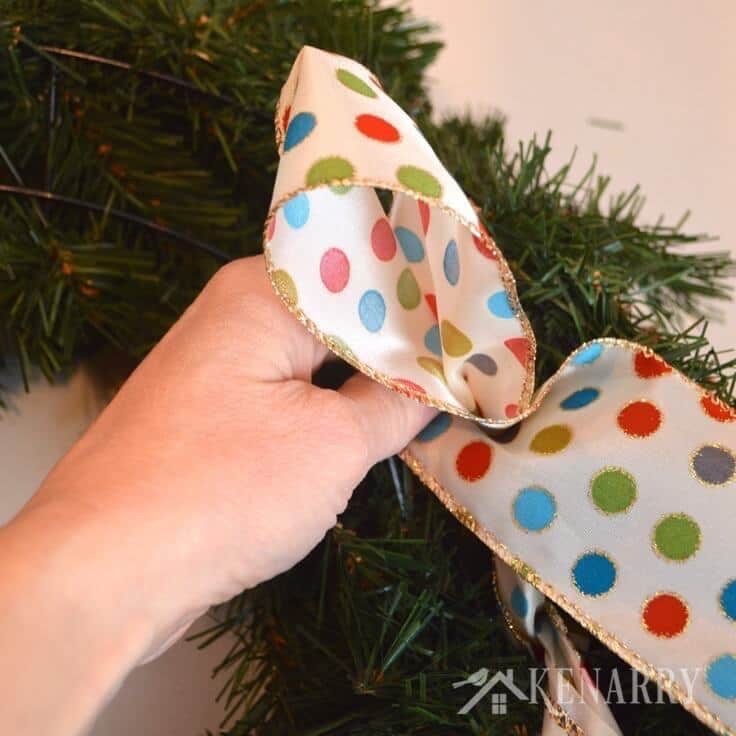 Determine whether you want the red bow at the top or bottom of your wreath. Mine’s always been at the bottom so I left it there. I like how the ends of the ribbon dangle down below giving the whole Outdoor Christmas Wreath a bigger, more dramatic appearance. 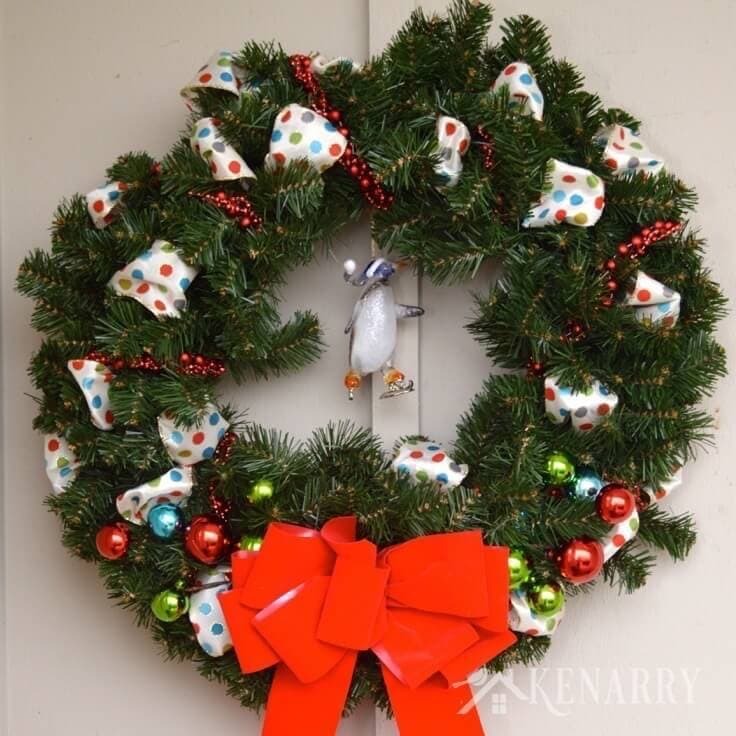 Attach the bow to the frame of the Outdoor Christmas Wreath. 2. Weave the wired ribbon through the Outdoor Christmas Wreath. 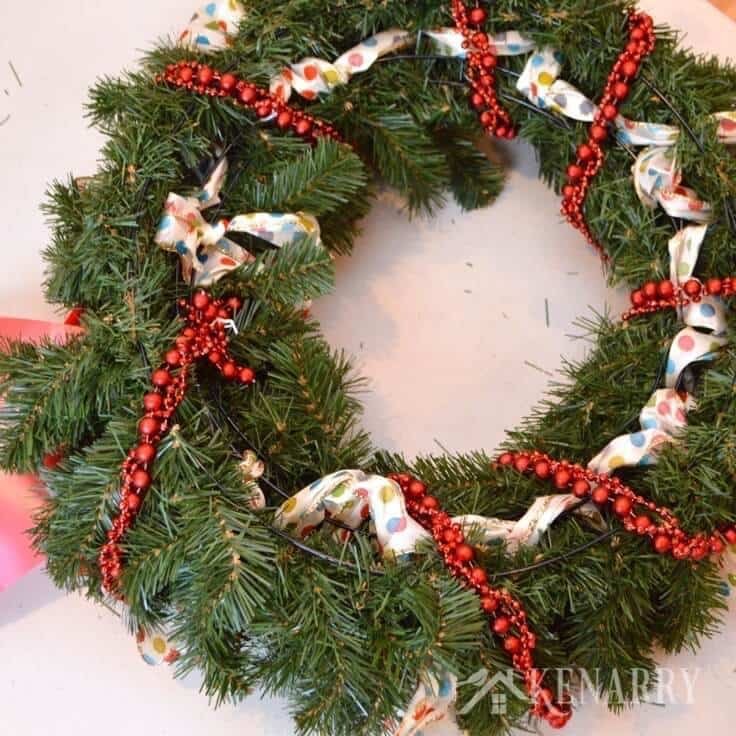 Flip the Outdoor Christmas Wreath over and tie one end of the 2 inch wide wired ribbon to the frame of the wreath near the red velvet outdoor bow. Next, from the back side of the Outdoor Christmas Wreath, twist the ribbon to form a loop. 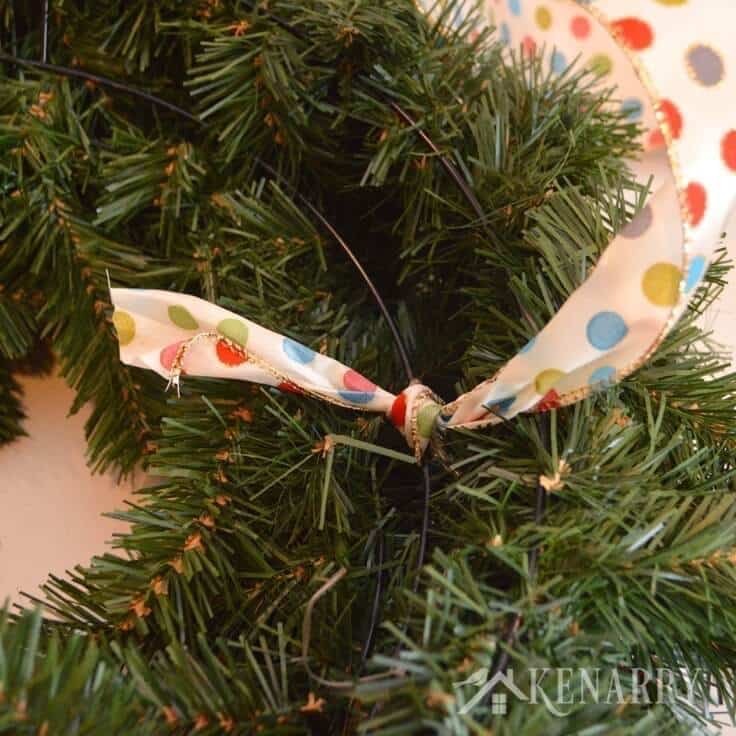 Then push a loop of ribbon through the wire wreath frame so it pops through on the front side. Now twist the ribbon again and push another loop through a different spot on the wreath near where you put the first loop. Continue to do this over and over again popping loops of ribbon through the wire wreath frame until you’ve gone all the way around the Outdoor Christmas Wreath. Make sure you twist the ribbon each time so it changes it’s orientation. If your wreath frame is like mine, you’ll have four different wires on the frame with three spaces between each wire. Make sure you alternate which space you use each time too. This will give the pops of ribbon some variety when you look at it from the front. Once you’re done, you can cut the ribbon and tie the end to the wire frame to secure it. Then fluff the ribbons with your fingers to spread them out and widen them to give a full appearance. 3. 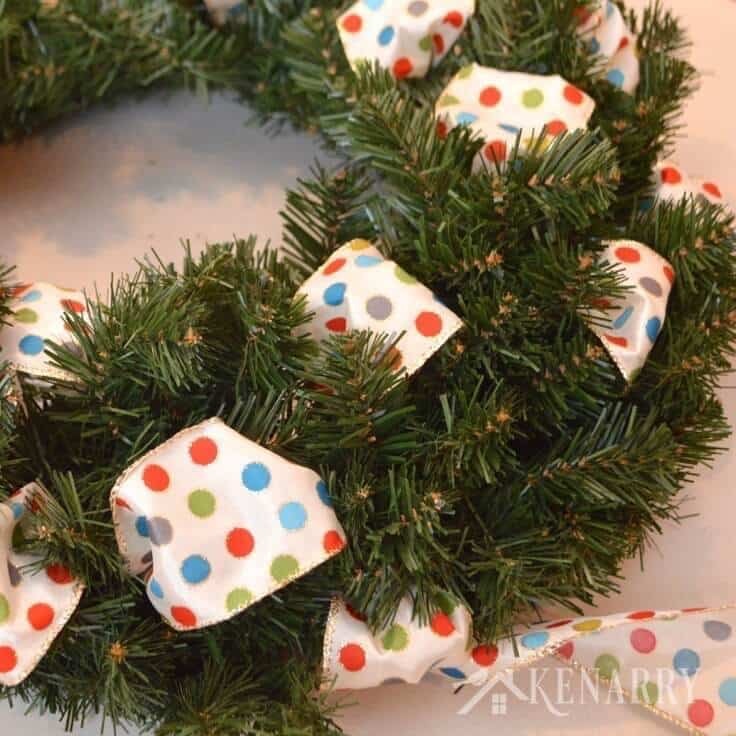 Wrap the red bead garland around the Outdoor Christmas Wreath. 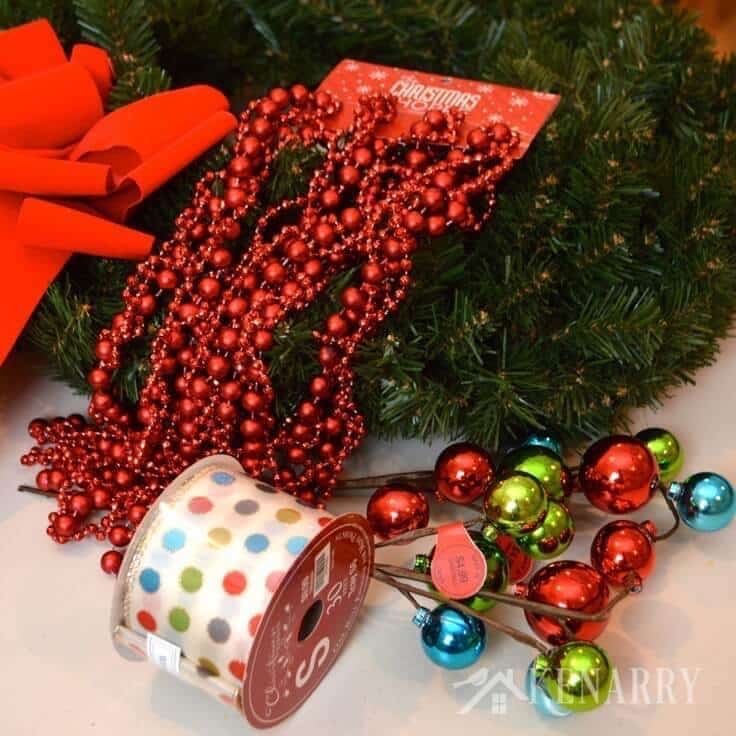 Use a twist tie to attach one end of the red bead garland to the wire frame of the wreath near where you knotted the ribbon. 4. Add embellishments. Use ribbon, wire or a twist tie to attach an ornament to the top center of the Outdoor Christmas Wreath so it dangles down into the middle. Be sure to choose an ornament that can withstand outdoor conditions. Tuck Christmas picks into either side of the red velvet ribbon. Mine have multi-colored ornaments on them which coordinate beautifully with the colors on the wired ribbon I chose. If you’re not sure what I mean by Christmas picks, check out these examples of Christmas picks on Amazon. You can find them at any craft store around the holidays or they could also be with floral arranging supplies. 5. Hang and enjoy your Outdoor Christmas Wreath. You’re all done! It’s time to hang your beautiful Outdoor Christmas Wreath outside your home for Christmas. I have a three foot space with board and batten to the left of my front door so I choose to hang it on a nail there. If you want to hang it directly on your door, there are numerous wreath hangers you can get, including magnetic wreath hangers for steel doors and suction cup wreath hangers if you have a glass window on your front door. Once you hang the Outdoor Christmas Wreath, you may need to fluff the branches and move them around to give the wreath a fuller, more natural appearance. Your gorgeous new Outdoor Christmas Wreath is going to be admired by your family and friends when they visit your home for Christmas. They won’t believe you just whipped it up quickly in less than an hour. Need more ideas to inspire your “Home for Christmas”? Look no further, my friends. Today we’re sharing our Outdoor Christmas Wreath as part of the “Home for Christmas” event with HomeTalk.com and CountryLiving.com. Bloggers from around the globe are sharing their very best DIY home decor and decorating tips to help you create a beautiful Home for Christmas. 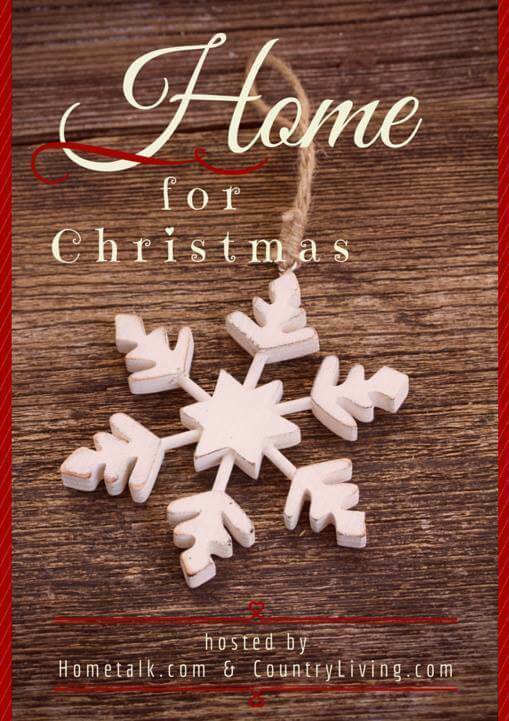 You will find dozens and dozens of the very best, most beautiful ideas and Christmas decorating trends right here at the “Home for Christmas” event. I encourage you to hop around and check out all of these incredible ideas. You can also search HomeTalk.com and other social media for the hashtag #homeforchristmas to find and share the ideas you see here. Which one (or two or five!) are you inspired to try this year? Please comment below and share – or better yet once you make it, share a picture on social media with the hashtag #homeforchristmas and tag us in it too so we can see what you created! 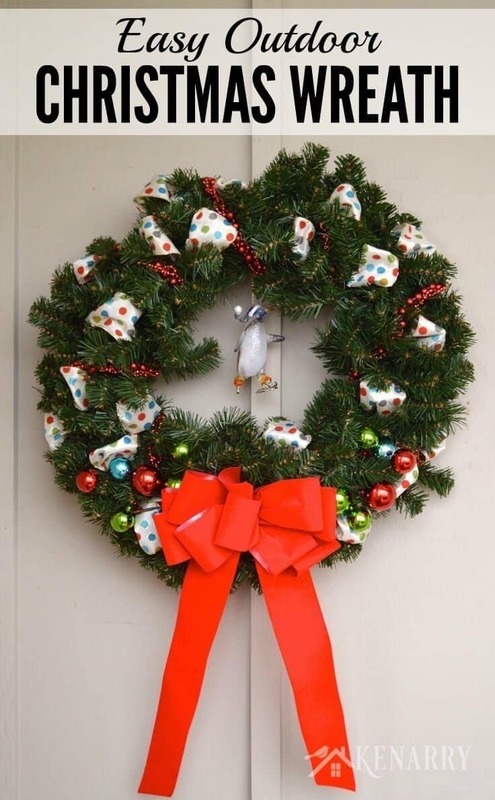 Marie, thank you so much for pinning our Outdoor Christmas Wreath. We really appreciate it. The wreath is beautiful. I love the bright colors and the penguin. Too cute! Thank you, Vanessa! I’m so glad you like it and am thrilled you stopped by.